Rosh Hashanah is the Jewish New Year. In the Hebrew calendar, the fall holiday occurs on the first and second days of the month Tishrei. Rosh Hashanah represents the miraculous creation of the first humans, Adam and Eve. When celebrating Rosh Hashanah, the Jewish people gather in synagogues all over the world to mark the Earth’s birthday. However, the holiday is not only celebration. Its also a serious day for thinking about the sin in a person’s life and getting right with the Creator of the Universe. According to Jewish tradition, Rosh Hashanah is the “day of judgment” or the “day of remembrance.” On this holiday it is believed that God sits on his throne and looks through books that record all the deeds of everyone on Earth. God then decides who has been righteous or wicked. The names of the wicked are believed to be erased from the Book of Life. During the ten days between Rosh Hashanah and another Jewish holiday called Yom Kippur, the Jewish people do three things. Everyone must ask for forgiveness from each other for any wrongdoings. In Hebrew it’s called Teshuvah. They also pray and ask God for forgiveness for their sins which is called Tefillah. And they give charity to the poor and needy. This is called Tzedakah. They believe doing these acts help “seal” their name in the Book of Life. During Rosh Hashanah people blow the shofar to signal the holiday. You can hear shofar blasts all over Jerusalem. The shofar is a musical instrument made out of ram’s horn. The shofar is meant to wake everyone up so they will be ready for the judgment. It’s like a spiritual alarm clock! The custom on Rosh Hashanah is to tell everyone you see “L’shana Tova.” That means “have a good new year.” Rosh Hashanah begins at sunset on September 23, 2014. It is followed by the fast of Yom Kippur and the holiday of Sukkot. This entire period is called the “High Holiday” season. 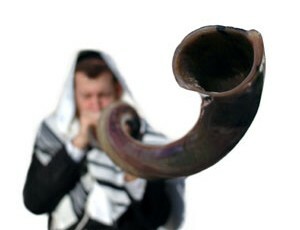 The Shofar is a very important part of Rosh Hashanah. Shofars are usually made out a ram’s horn because of the ram’s connection to the story of Abraham and Isaac. Do you remember how God placed a ram in the bushes and Abraham was able to sacrifice the ram instead of Isaac? Shofars are blown during synagogue services. No one is allowed to talk while the shofar is blasting. The ‘shofar blower’ always dresses in an all-white robe to symbolize purity. According to the New Testament, God has given his Son, Jesus, authority to judge the “living and the dead” (2 Timothy 4:1). Jesus told his followers in John 5:24, “I tell you the truth, those who listen to my message and believe in God who sent me have eternal life. They will never be condemned for their sins, but they have already passed from death into life.” Therefore, the sacrifice and atonement of Jesus for the sins of the world has become the fulfillment of the “day of judgement.” Believe, and you will be saved! Hi I was wondering whether we could copy one of the pictures of the shofar. We want to you use it for a Jewish publication?